Five aid groups operating migrant rescue ships in the Mediterranean refuse to sign up to the Italian government’s code of conduct, the Interior Ministry said, but three others backed the new rules. Charity boats have become increasingly important in rescue operations, picking up more than a third of all migrants brought ashore so far this year against less than one percent in 2014, according to the Italian coastguard. Italy fears the groups are facilitating people smuggling from North Africa and encouraging migrants to make the perilous passage to Europe, and has proposed a code containing a dozen or so points for the charities. Those who refuse to sign the document put themselves “outside the organised system of sea rescues, with all the consequences that can have”, the ministry said. Italy previously threatened to shut its ports to NGOs that did not sign up, but an Interior Ministry source said those groups would face more checks from Italian authorities. 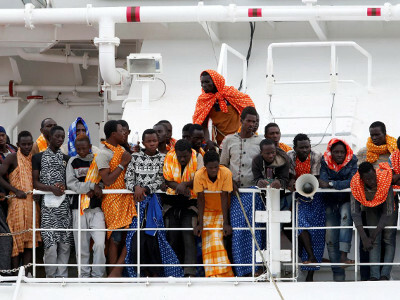 Doctors Without Borders (MSF), which has taken part in many of rescues of some 95,000 migrants brought to Italy this year, attended a meeting at the Interior Ministry but refused to sign the code. MSF objected strongly to a requirement that aid boats must take migrants to a safe port themselves, rather than transferring people to other vessels, which allows smaller boats to stay in the area for further rescues. “Our vessels are often overwhelmed by the high number of migrant boats … and life and death at sea is a question of minutes,” MSF Italy’s director Gabriele Eminente wrote in a letter to Interior Minister Marco Minniti. “The code of conduct puts at risk this fragile equation of collaboration between different boats,” Eminente continued, adding MSF still wanted to work with the ministry to improve sea rescues. But Save The Children gave its backing, saying it already complied with most rules and would monitor constantly to be sure applying them did not obstruct their work. “We would not have signed if even one single point would have compromised our effectiveness. This is not the case, not one single point of the code will hinder our activities,” Save The Children Italy director Valerio Neri said after the meeting. The Malta-based Migrant Offshore Aid Station (MOAS) and Spanish group Proactiva Open Arms agreed to the conditions, but Germany’s Sea-Watch, Sea-Eye and Jugend Rettet, and France’s SOS Mediterranee abstained. MSF, SOS Mediterranee and Jugend Rettet called for clarity on the rules and took issue with a clause in the code obliging groups to accept police officers on board. “For us the most controversial point … was the commitment to help the Italian police with investigations and possibly take armed police officers on board,” Jugend Rettet co-ordinator Titus Molkenbur said.